July 25, 2011 - AMR Corporation, the parent company of American Airlines, announced its intent to move forward with the divestiture of AMR Eagle Holding Corporation ("Eagle"). AMR currently expects the divestiture to take the form of a spin-off of Eagle stock to the shareholders of AMR. "We believe that a divestiture of Eagle would be in the best interests of AMR and Eagle, as well as our shareholders, customers and employees," said AMR Chairman and CEO Gerard Arpey. "Strategically for AMR, it would be beneficial, as we could, over time, diversify our regional feed with additional regional airlines to ensure we have access to the most competitive rates and service. ?A divestiture could provide Eagle an opportunity to vie for business of other mainline carriers and allow the carrier to grow. I am proud of the accomplishments of American and Eagle as a combined group of companies under AMR for the past 26 years, and I look forward to their future, independent successes." American Eagle Airlines is a brand name used by American Eagle Airlines, Inc. (formerly Simmons Airlines), based in Fort Worth, Texas, and Executive Airlines based in San Juan, Puerto Rico, in the operation of passenger air service as regional affiliates of American Airlines. 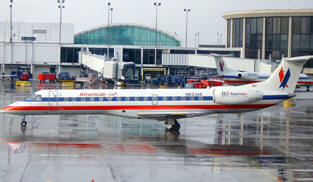 All three airlines are wholly owned subsidiaries of AMR Corp.
American Airlines also allows codeshares with unrelated regional airlines under contract to provide regional service under the American Connection brand. Operating over 1,800 flights a day, serving 159 cities across the USA, Canada, Mexico and the Caribbean, American Eagle is considered to be the world's largest regional airline system. The American Eagle brand is an affiliate member of the Oneworld airline alliance, and has a code share agreement with Delta Air Lines on California routes. The name was also used between April 1980 and April 1981 by an unrelated air charter service that suspended operations and filed bankruptcy before flying any scheduled operations. "For everyone here at Eagle, our highest priority will be to continue operating safely and reliably for all of our customers ? and earning American's business every day," said Dan Garton, President and CEO of AMR Eagle and American Eagle Airlines. "We are excited about today's announcement and the opportunities for growth that would be available to us as an independent carrier. We're eager to take on those new challenges." As part of the process of preparing for a potential spin-off of Eagle, in August AMR Eagle Holding Corporation expects to file a Registration Statement on Form 10 with the Securities and Exchange Commission related to the intended divestiture. The Registration Statement on Form 10 will describe the divestiture and will contain important information about Eagle, including its historical consolidated financial statements. A specific time frame for the divestiture has not been announced. The company currently envisions the divestiture as a spin-off, however, it remains open to other options, including a sale, as the transaction moves forward.